Where: Watsco Center | Coral Gables, Fla.
- Notre Dame and Miami will meet or the 23rd time. The all-time series is tied at 11-11. - The Canes lead the series 4-3 since Notre Dame joined the ACC. - Notre Dame guard Prentiss Hubb and Miami guard Chris Lykes were high school teammates at Gonzaga College High School. - Forward John Mooney leads the ACC in double-doubles with 14 in 22 games (14.5ppg, 10.9 reb). - Mooney has posted a double-double in eight consecutive games. - Notre Dame is second in the country in turnovers committed per game (9.5) behind national-leader Virginia (9.0). - TJ Gibbs became the 63rd Notre Dame player to reach 1,000 career points last Saturday. Notre Dame and Miami are similar programs in many ways as both rosters have been depleted as February hits. Notre Dame lost Rex Pflueger and Robby Carmody to injuries while Elijah Burns decided to transfer. The Canes lost standout Dewan Hernandez as the NCAA ruled him ineligible and Deng Gak injured his knee eight games in the season. Miami does pose an interesting challenge for Notre Dame as all five starters average in double-figures, including former Notre Dame target Chris Lykes. The 5-foot-7 point guard might lack size but he’s not afraid to take big shots and is scoring 16.7 points a night. Notre Dame will likely have the deeper rotation, which is weird to write, but Miami played seven players against Virginia. The seventh man, freshman guard Anthony Mack, played just six minutes, so it’s more like a six-man rotation. For Notre Dame to win, it will be about offense and yes, it’s sounding like a broken record, but it’s what this team has struggled with all season. Junior Nik Djogo broke out for 21 points at Boston College but I’m not sure Mike Brey is going to count on another 20-point performance from him on Wednesday. Forward Juwan Durham could be the X-factor against Miami as the Canes play four guards. Durham can provide rim protection and potentially create mismatches on the other end if they can pair him with John Mooney. I said it on Saturday, but Brey and sophomore guard DJ Harvey need to figure out the offensive end of the floor. Harvey has gone four games without reaching double-figures and is just 8-for-32 from the field over those contests, including scoring just three points on Saturday. Harvey has struggled at times playing within Brey’s offensive system and probably shoots too many three-pointers as he’s just 25-for-88 (28%) from behind the arc this season. I would love to see him get some action on cuts and driving the ball to the rack, but it might be a confidence issue as Harvey is working his way back from microfracture surgery. 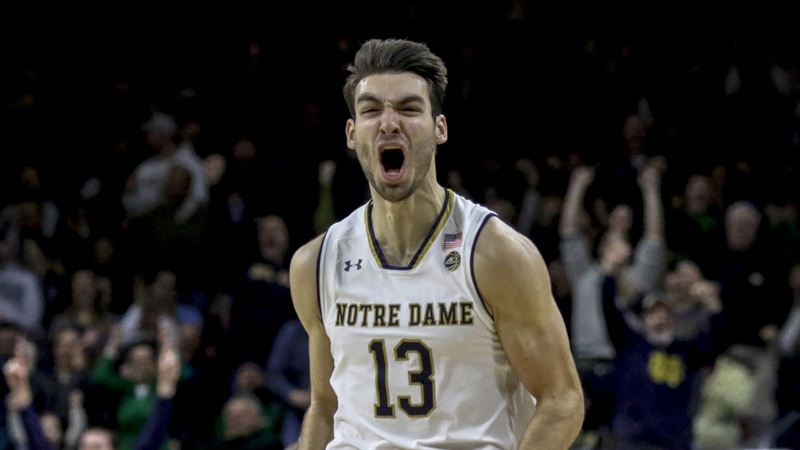 This is a game Notre Dame should win despite the struggles of January and youth movement.